I think it’s human nature: when any new relationship begins, you want to know something about the person you’ve just met. 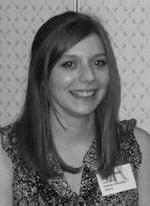 As you’re reading this blog, I feel that I should probably say ‘Hello, I’m Rachel’, and tell you something about myself. I’m not going to use this post to give you a condensed curriculum vitae, or a life history. I’m also not going to bother necessarily with a long-winded job description (at some point, I will hopefully attempt an ‘About’ page, and anyway, as I’m attempting to use this to record my Chartership activities and thoughts about librarianship, I would hope that I’ll get round to covering some of this over the coming weeks, months and years). But, as I’ve been following posts about the Library Routes project for some time, I thought I’d contribute to the discussion by telling you how I’ve ended up where I am now, starting to work towards CILIP Chartership. And I am going to attempt this through the medium of the flowchart. I’m 20/21 and I’m working flat-out on my degree as it’s my final year. If you talk to final year university students, you will realise that amidst the coursework/revision/exam panic, there is also that big question hovering ominously overhead; ‘what am I going to do when I graduate?’. Let’s unpack this a bit further. At this point, I was in full-time education, which had been the case for about 16 years, so my first consideration was whether I wanted to continue down this route. And I could have done – I’m fairly capable academically, and I was interested in both research and taught options. I even applied successfully for a place at the University of Sheffield’s MA in Librarianship course. 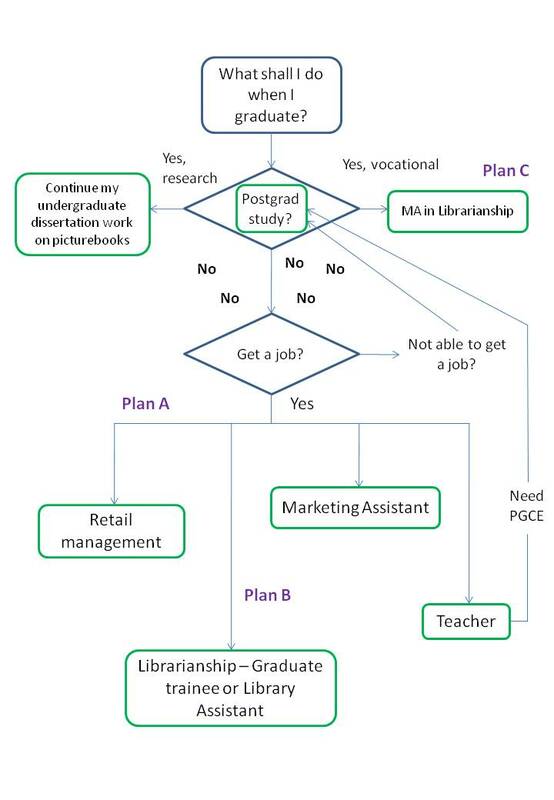 But as you might be able to make out from the numerous “No”s around this option (I think when I put the flowchart together I was thinking Bohemian Rhapsody…) I wasn’t too keen on the prospect of postgraduate study. No – I felt I needed a break from education. No – I’d already amassed around £20k of student debt under the new top-up fees introduced the year I went to university, and I didn’t really want to add any more to that total. No – Research, although intrinsically valuable, wasn’t going to necessarily make me better equipped to enter the job market, or the world of work. No – A taught masters in librarianship? Not a bad idea – I had worked for one of the University’s college libraries throughout my undergraduate degree, and since getting involved in the management of the library, I was beginning to think about working within the library and information sector. But I wasn’t completely sure I wanted to be a librarian – certainly not sure enough to pay yet more money and spend more time studying without clearing that up. I also had my reservations about the quality of the courses available and the impression that the LIS masters course were sort of a tick-box exercise (since working full-time in the sector, my opinion hasn’t changed). No – I had personal reasons for wanting to stay in the North East. At the start of my final year, the personal reasons were my partner, who worked locally, and my attachment to the area. It was going to be easier to get a suitable job in the area than find the right postgraduate course, but initially I was willing to move within a couple of hours of Newcastle, which gave me some flexibility. However, by the time I graduated, in summer 2009, the circumstances I found myself in meant that I needed, if possible, to stay exactly where I was. I won’t go into details, but it was pretty much literally life or death. Determined to get a job, I had applied, interviewed for and subsequently wasn’t offered graduate management trainee roles by a couple of major department stores (it wouldn’t have suited me, anyway, in hindsight). It was just after my finals when a Library Assistant post came up at the university library. I decided to apply and I was offered an interview. I went into it knowing that (due to what was going on else I needed to get the job – I think I almost said as much to the panel that interviewed me. I was offered the position a few weeks before I graduated, and I remember getting the phone call from the Deputy Librarian and dancing around the kitchen through pure relief. It’s strange how these things happen. In the end, although there was a solid decision-making process behind it, one that I can even document through a flowchart, the reason I ended up being a librarian was through necessity – the job came up in the right place, at the right time. Necessity, or coincidence, or maybe it was just meant to happen. And Chartership? Well, I’m never one for standing still… approaching a year in my current role, I decided to work towards CILIP Certification. As I’m based within the academic liaison team, my role isn’t exactly a typical library assistant post, and I would argue that a lot of the work I do is at a “professional” level. So after my application for Certification was approved, working towards Chartering seems the next obvious step. It might not have been exactly what I intended, and it may not be forever, but for what it’s worth Plan B is working out pretty well.